Authorities in the Indian city of Mumbai (Bombay) have ordered an evacuation of dangerous buildings after the second fatal collapse in a week. Almost 900 tenants in 80 buildings deemed dangerous in southern Mumbai will be moved to holding camps within a week, the authorities say. The move follows the death of six people in the collapse of a three-storey building on Sunday night. Last week, another 11 people died when a four-storey building came down. Correspondents say it is not uncommon for poorly maintained buildings to collapse during the monsoon rains in Mumbai. This season's rains have caused the deaths of more than 1,100 people in Mumbai and Maharashtra state, of which it is the capital. Maharashtra's chief minister, Vilasrao Deshmukh, on Monday ordered the state run housing authority, the Maharashtra Housing and Area Development Authority, to move the at-risk tenants. Public relations officer for the authority, Vaishali Wagh, told the BBC news website: "We carried out a post-monsoon survey of buildings in south Mumbai after the heavy rains in July. "We identified 503 buildings as 'dangerous' and of these, 80 are considered 'very dangerous'. "The chief minister has instructed us to take immediate action on these buildings and we will be moving the residents soon." Ms Wagh said the tenants of the building that collapsed late on Sunday night had been notified of the danger and were asked to vacate but were reluctant to do so. Police said the building housed three families and was at least 60 years old. Senior police official VB Bobade said four people hurt in the collapse had been discharged from hospital after treatment. 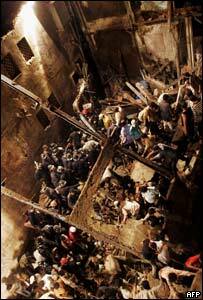 The fatal collapse of a residential building on 23 August killed 11 and injured more than 20. Most residents were asleep when the structure came down. 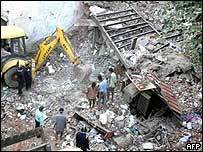 A third building, in the Tardeo area in central Mumbai, also collapsed recently, although no one was hurt as residents had evacuated. According to one estimate, there are some 19,000 tall buildings in Mumbai that are "old and dilapidated".